NOTE: THIS SET IS FOR THE VINTAGE POLAR LIGHTS KIT! This is NOT a cheap, incomplete set of decals for your model. 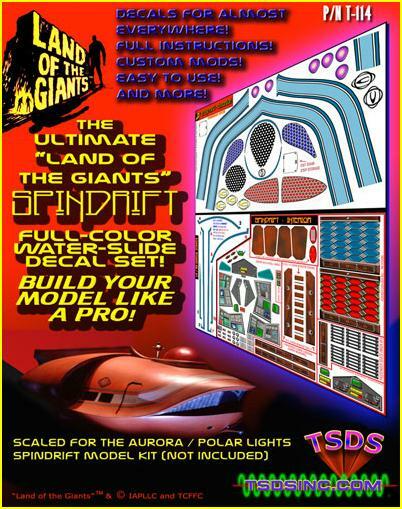 This is an extremely detailed full color COMPLETE set of decals designed for the professional and amateur modeler, allowing them to do some basic surface painting, and then most of the rest of the model building part is applying these decals! This set is designed to be highly accurate and includes a few duplicate decals allowing you to assemble your SPINDRIFT with all the detail you deserve! There are decals for almost every surface on the model wherever needed — from the outer door hatch to the simulated wood grain doors of the bathroom and galley. BUY YOURS TODAY AND AMAZE PEOPLE WITH YOUR MODELING SKILLS! TURN YOUR MODEL INTO A MUSEUM-QUALITY PROP! NOTE: THESE ARE TRANSPARENT DECALS LASER-PRINTED ON CLEAR MEDIA! THEY DO NOT SHOW UP WELL ON DARK OR RED SURFACES! A SIMPLE BRUSH OF WHITE PAINT WHEREVER YOU ARE PLACING THEM WILL MAKE THEM STAND OUT! 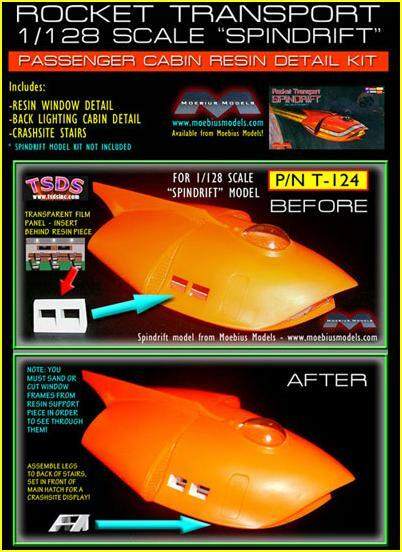 NOTE: THIS SET WILL ONLY FIT THE MOEBIUS MODELS 1/128 SCALE ROOCKET TRANSPORT MODEL!! 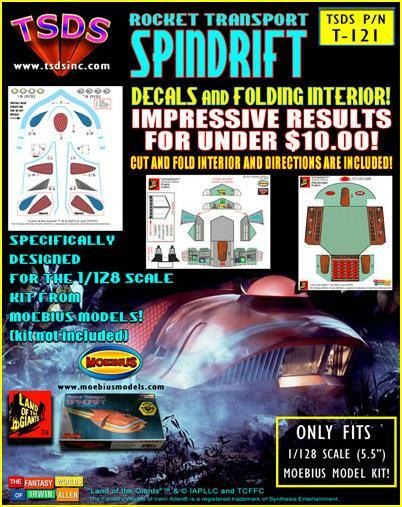 JUST IN TIME FOR THE RELEASE OF A LONG-AWAITED “SPINDRIFT” MODEL KIT FROM MOEBIUS MODELS! INCLUDES EXTERIOR DECALS, AND ALSO INCLUDES A MINI FOLDING INTERIOR THAT IS A BIT MORE ACCURATE THAN THE ONE INCLUDED IN THE KIT AND SHOULD BE A BIT EASIER TO ASSEMBLE! ALSO INCLUDES COCKPIT SEATS! THIS SHOULD ADD THE NICE FINISHING TOUCH TO A SPLENDID MODEL KIT! EASY TO APPLY DECALS, AND SIMPLY CUT AND FOLD UP THE INTERIOR, THEN TAPE OR GLUE IT INTO THE MODEL! NICE AND EASY, JUST THE WAY WE LIKE IT! THIS IS A GREAT WAY TO GIVE YOUR MODEL THAT “PRO” LOOK FOR UNDER $10.00! INCLUDES RESIN PASSENGER WINDOW FRAMES, STYREN “CRASHSITE” STAIRS, AND A TRANSLUCENT COLOR PANEL FOR BEHIND THE PASSENGER CABIN WINDOW FRAMES SIMULATING THE PASSENGER CABIN. PERFET FOR LIGHTING TO GIVE THIS EXCELLENT MODEL KIT THAT EXTRA-SPECIAL TOUCH! 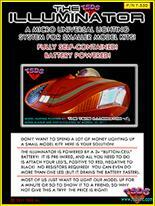 PICK UP THE TSDS “ILLUMINATOR” BATTERY OPERATED MICRO LIGHTING SYSTEM TO COMPLETE YOUR BUILD! EASILY LIGHT THIS MODEL FOR LESS THAN TEN BUCKS!